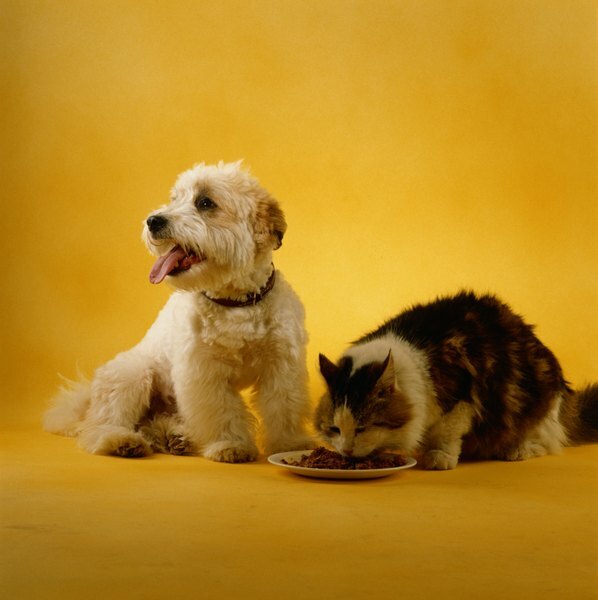 Don't let Fido sneak Fluffy's food, whether it's prescription food or other. Premium commercial cat food provides all the nutrition a healthy cat needs, in most cases. Prescription diets, infused with theraputic ingredients, are advisable for treating specific conditions. Prescription pet foods are available only through your vet's office and only on his recommendation. Commercial diets for felines are available for your convenience at many retailers. These diets are appropriate for all cats, although some are designed for different life stages. The U.S. Food and Drug Administration regulates the production of pet food by requiring that manufacturers use ingredients generally considered safe for animal consumption, that they use sanitary conditions when preparing their products and that they label them truthfully. The FDA doesn't regulate the amounts of ingredients used or require that the food is nutritionally sound -- just safe. 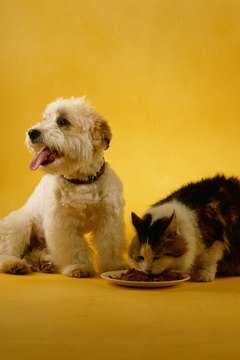 Most commercial pet food manufacturers follow the nutritional profiles provided by the Association of American Feed Control Officials. Based on feeding trials, these profiles ensure that the food provides adequate nutrition for your kitty. Like commercial diets, prescription diets must contain ingredients that are safe for your kitty. Prescription diets are available only through a veterinarian's office. The FDA regulates these foods differently than commercial foods, classifying them more as drugs than foods. According to the FDA, a drug is something that's used to diagnose, cure, mitigate, treat or prevent disease. For this reason, pet food manufacturers must back up the medical claims they make about their therapeutic foods with scientific evidence and laboratory testing. Such evidence must support whether or not the food actually treats a specific illness effectively and whether it's safe for feline consumption. Without such data, the foods won't be approved by the FDA. Prescription veterinary diets include those that treat obesity, urinary crystals, kidney disease or food allergies. Therapeutic diets to treat kidney disease or that prevent the formation of urinary crystals contain different amounts of some ingredients than commercial diets. These ingredients include magnesium, phosphorus, protein and calcium, according to the Hill's Pet Nutrition website. Low-calorie diets contain higher amounts of fiber or lower amounts of carbohydrates, depending on the formula. Food allergy diets contain unusual proteins or carbohydrates that aren't found in commercial foods to prevent an allergic reaction. Your vet may prescribe a special therapeutic diet for your cat if she's suffering from a condition the diet can treat. In some cases, such a diet negates the need for prescription drugs to treat Fluffy's condition. Your vet will determine whether you should feed Fluffy the prescription diet indefinitely or for a short period of time. Some of these diets are not nutritionally complete or designed for long-term feeding after they help to diagnose or resolve your kitty's condition, according to the American Animal Hospital Association. Don't switch your kitty back to a commercial diet without consulting your vet; doing so could induce or worsen a medical issue. Because manufacturers of nonprescription commercial diets for felines can't make medical claims about them on their labels due to FDA regulations, there are no commercial equivalents to prescription cat foods, even if they are made by the same manufacturer. Keep in mind that therapeutic diets are not substitutes for drugs, nor do they contain drugs -- they only contain a balance of ingredients scientifically shown to alleviate or treat an illness. The only thing commercial cat food can provide for Fluffy is proper nutrition. American Animal Hospital Association: What’s in Your Pet’s Food? petMD: Is Tighter Enforcement on the Horizon for OTC Therapeutic Diets? Can Tresaderm Be Used on Young Kittens?